One provision of the Fifth Amendment requires that felonies be tried only upon indictment by a grand jury. Another provision, the Double Jeopardy Clause, provides the right of defendants to be tried only once in federal court for the same offense. The self-incrimination clause provides various protections against self-incrimination, including the right of an individual to not serve as a witness in a criminal case in which they are the defendant. "Pleading the Fifth" is a colloquial term often used to invoke the self-incrimination clause when witnesses decline to answer questions where the answers might incriminate them. In the 1966 case of Miranda v. Arizona, the Supreme Court held that the self-incrimination clause requires the police to issue a Miranda warning to criminal suspects interrogated while under police custody. The Fifth Amendment also contains the Takings Clause, which allows the federal government to take private property for public use if the government provides "just compensation." Like the Fourteenth Amendment, the Fifth Amendment includes a due process clause stating that no person shall "be deprived of life, liberty, or property, without due process of law." The Fifth Amendment's due process clause applies to the federal government, while the Fourteenth Amendment's due process clause applies to state governments. The Supreme Court has interpreted the Fifth Amendment's Due Process Clause as providing two main protections: procedural due process, which requires government officials to follow fair procedures before depriving a person of life, liberty, or property, and substantive due process, which protects certain fundamental rights from government interference. The Supreme Court has also held that the Due Process Clause contains a prohibition against vague laws and an implied equal protection requirement similar to the Fourteenth Amendment's Equal Protection Clause. This draft was edited by Congress; all the material before the first ellipsis was placed at the end, and some of the wording was modified. 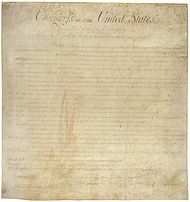 After approval by Congress, the amendment was ratified by the states on December 15, 1791 as part of the Bill of Rights. Every one of the five clauses in the final amendment appeared in Madison's draft, and in their final order those clauses are the Grand Jury Clause (which Madison had placed last), the Double Jeopardy Clause, the Self Incrimination Clause, the Due Process Clause, and then the Takings Clause. The grand jury is a pre-constitutional common law institution, and a constitutional fixture in its own right exclusively embracing common law. The process applies to the states to the extent that the states have incorporated grand juries and/or common law. Most states have an alternative civil process. "Although state systems of criminal procedure differ greatly among themselves, the grand jury is similarly guaranteed by many state constitutions and plays an important role in fair and effective law enforcement in the overwhelming [p688] majority of the States." Branzburg v. Hayes (No. 70-85) 1972. Grand juries, which return indictments in many criminal cases, are composed of a jury of peers and operate in closed deliberation proceedings; they are given specific instructions regarding the law by the judge. Many constitutional restrictions that apply in court or in other situations do not apply during grand jury proceedings. For example, the exclusionary rule does not apply to certain evidence presented to a grand jury; the exclusionary rule states that evidence obtained in violation of the Fourth, Fifth or Sixth amendments cannot be introduced in court. Also, an individual does not have the right to have an attorney present in the grand jury room during hearings. An individual would have such a right during questioning by the police while in custody, but an individual testifying before a grand jury is free to leave the grand jury room to consult with his attorney outside the room before returning to answer a question. Grand jury indictments may be amended by the prosecution only in limited circumstances. In Ex Parte Bain, 121 U.S. 1 (1887), the Supreme Court held that the indictment could not be changed at all by the prosecution. United States v. Miller, 471 U.S. 130 (1985) partly reversed Ex parte Bain; now, an indictment's scope may be narrowed by the prosecution. Thus, lesser included charges may be dropped, but new charges may not be added. The Grand Jury Clause of the Fifth Amendment does not protect those serving in the armed forces, whether during wartime or peacetime. Members of the state militia called up to serve with federal forces are not protected under the clause either. In O'Callahan v. Parker, 395 U.S. 258 (1969), the Supreme Court held that only charges relating to service may be brought against members of the militia without indictments. That decision was overturned in 1987, when the Court held that members of the militia in actual service may be tried for any offense without indictments. Whether a crime is "infamous", for purposes of the Grand Jury Clause, is determined by the nature of the punishment that may be imposed, not the punishment that is actually imposed; however, crimes punishable by death must be tried upon indictments. The historical origin of "infamous crime" comes from the infamia, a punishment under Roman law by which a citizen was deprived of his citizenship. In United States v. Moreland, 258 U.S. 433 (1922), the Supreme Court held that incarceration in a prison or penitentiary, as opposed to a correction or reformation house, attaches infamy to a crime. In Mackin v. United States, 117 U.S. 348 (1886), the Supreme Court judged that "'Infamous crimes' are thus, in the most explicit words, defined to be those 'punishable by imprisonment in the penitentiary. '", while it later in Green v. United States 356 U.S. 165 (1957), stated that "imprisonment in a penitentiary can be imposed only if a crime is subject to imprisonment exceeding one year". Therefore, an infamous crime is one that is punished by imprisonment for over one year. Susan Brown, a former defense attorney and Professor of Law at the University of Dayton School of Law, concluded: "Since this is essentially the definition of a felony, infamous crimes translate as felonies." The government is not permitted to appeal or try again after the entry of an acquittal, whether a directed verdict before the case is submitted to the jury, a directed verdict after a deadlocked jury, an appellate reversal for sufficiency (except by direct appeal to a higher appellate court), or an "implied acquittal" via conviction of a lesser included offense. In addition, the government is barred by collateral estoppel from re-litigating against the same defense, a fact necessarily found by the jury in a prior acquittal, even if the jury hung on other counts. This principle does not prevent the government from appealing a pre-trial motion to dismiss or other non-merits dismissal, or a directed verdict after a jury conviction, nor does it prevent the trial judge from entertaining a motion for reconsideration of a directed verdict, if the jurisdiction has so provided by rule or statute. Nor does it prevent the government from retrying the defendant after an appellate reversal other than for sufficiency, including habeas, or "thirteenth juror" appellate reversals notwithstanding sufficiency on the principle that jeopardy has not "terminated." There is also an exception for judicial bribery in a bench trial. The rule for mistrials depends upon who sought the mistrial. If the defendant moves for a mistrial, there is no bar to retrial, unless the prosecutor acted in "bad faith", i.e., goaded the defendant into moving for a mistrial because the government specifically wanted a mistrial. If the prosecutor moves for a mistrial, there is no bar to retrial if the trial judge finds "manifest necessity" for granting the mistrial. The same standard governs mistrials granted sua sponte. "Plead the Fifth" redirects here. For the album by the band Taproot, see Plead the Fifth (album). The Fifth Amendment protects individuals from being forced to incriminate themselves. Incriminating oneself is defined as exposing oneself (or another person) to "an accusation or charge of crime," or as involving oneself (or another person) "in a criminal prosecution or the danger thereof." The privilege against compelled self-incrimination is defined as "the constitutional right of a person to refuse to answer questions or otherwise give testimony against himself. ... " To "plead the Fifth" is to refuse to answer any question because "the implications of the question, in the setting in which it is asked" lead a claimant to possess a "reasonable cause to apprehend danger from a direct answer", believing that "a responsive answer to the question or an explanation of why it cannot be answered might be dangerous because injurious disclosure could result." The legal shift away from widespread use of torture and forced confession dates to turmoil of the late 16th and early 17th century in England. Anyone refusing to take the oath ex officio mero (confessions or swearing of innocence, usually before hearing any charges) was considered guilty. Suspected Puritans were pressed to take the oath and then reveal names of other Puritans. Coercion and torture were commonly used to compel "cooperation." Puritans, who were at the time fleeing to the New World, began a practice of refusing to cooperate with interrogations. In the most famous case John Lilburne refused to take the oath in 1637. His case and his call for "freeborn rights" were rallying points for reforms against forced oaths, forced self-incrimination, and other kinds of coercion. Oliver Cromwell's revolution overturned the practice and incorporated protections, in response to a popular group of English citizens known as the Levellers. The Levellers presented The Humble Petition of Many Thousands to Parliament in 1647 with 13 demands, the third of which was the right against self-incrimination in criminal cases. These protections were brought to America by Puritans, and were later incorporated into the United States Constitution through the Bill of Rights. Protection against compelled self-incrimination is implicit in the Miranda rights statement, which protects the "right to remain silent." This amendment is also similar to Section 13 of the Canadian Charter of Rights and Freedoms. In other Commonwealth of Nations countries like Australia and New Zealand, the right to silence of the accused both during questioning and at trial is regarded as an important right inherited from common law, and is protected in the New Zealand Bill of Rights Act and in Australia through various federal and state acts and codes governing the criminal justice system. The Supreme Court has held that "a witness may have a reasonable fear of prosecution and yet be innocent of any wrongdoing. The privilege serves to protect the innocent who otherwise might be ensnared by ambiguous circumstances." In the Salinas case, justices Alito, Roberts, and Kennedy held that "the Fifth Amendment's privilege against self-incrimination does not extend to defendants who simply decide to remain mute during questioning. Long-standing judicial precedent has held that any witness who desires protection against self-incrimination must explicitly claim that protection." Justice Thomas, siding with Alito, Roberts and Kennedy, in a separate opinion, held that, "Salinas' Fifth Amendment privilege would not have been applicable even if invoked because the prosecutor's testimony regarding his silence did not compel Salinas to give self-incriminating testimony." Justice Antonin Scalia joined Thomas' opinion." The right to remain silent was asserted at grand jury or congressional hearings in the 1950s, when witnesses testifying before the House Committee on Un-American Activities or the Senate Internal Security Subcommittee claimed the right in response to questions concerning their alleged membership in the Communist Party. Under the Red Scare hysteria at the time of McCarthyism, witnesses who refused to answer the questions were accused as "fifth amendment communists". They lost jobs or positions in unions and other political organizations, and suffered other repercussions after "taking the Fifth." Senator Joseph McCarthy (R-Wisc.) asked, "Are you now, or have you ever been, a member of the Communist Party," while he was chairman of the Senate Government Operations Committee Permanent Subcommittee on Investigations. Admitting to a previous Communist Party membership was not sufficient. Witnesses were also required to "name names," to implicate others they knew to be Communists or who had been Communists in the past. Academy Award winning director Elia Kazan testified before the House Committee on Un-American Activities that he had belonged to the Communist Party briefly in his youth. He also "named names," which incurred enmity of many in Hollywood. Other entertainers such as Zero Mostel found themselves on a Hollywood blacklist after taking the Fifth, and were unable to find work for a while in show business. Pleading the Fifth in response to such questions was held inapplicable, since being a Communist itself was not a crime. Law enforcement responded by switching to more subtle techniques, but the courts held that such techniques, even if they do not involve physical torture, may render a confession involuntary and inadmissible. In Chambers v. Florida (1940) the Court held a confession obtained after five days of prolonged questioning, during which time the defendant was held incommunicado, to be coerced. In Ashcraft v. Tennessee (1944), the suspect had been interrogated continuously for thirty-six hours under electric lights. In Haynes v. Washington, the Court held that an "unfair and inherently coercive context" including a prolonged interrogation rendered a confession inadmissible. The Court held "the prosecution may not use statements ... stemming from custodial interrogation of the defendant unless it demonstrates the use of procedural safeguards effective to secure the privilege against self-incrimination. Custodial interrogation is initiated by law enforcement after a person has been taken into custody or otherwise deprived of his freedom of movement before being questioned as to the specifics of the crime. As for the procedural safeguards to be employed, unless other fully effective means are devised to inform accused persons of their right of silence and to assure a continuous opportunity to exercise it, the following measures are required. Before any questioning, the person must be warned that he has a right to remain silent, that any statement he does make may be used as evidence against him, and that he has a right to the presence of an attorney, either retained or appointed." The warning to which Chief Justice Earl Warren referred is now called the Miranda warning, and it is customarily delivered by the police to an individual before questioning. Miranda has been clarified by several further Supreme Court rulings. For the warning to be necessary, the questioning must be conducted under "custodial" circumstances. A person detained in jail or under arrest is, of course, deemed to be in police custody. Alternatively, a person who is under the reasonable belief that he may not freely leave from the restraint of law enforcement is also deemed to be in "custody." That determination of "reasonableness" is based on a totality of the objective circumstances. A mere presence at a police station may not be sufficient, but neither is such a presence required. Traffic stops are not deemed custodial. The Court has ruled that age can be an objective factor. In Yarborough v. Alvarado (2004), the Court held that "a state-court decision that failed to mention a 17-year-old's age as part of the Miranda custody analysis was not objectively unreasonable". In her concurring opinion Justice O'Connor wrote that a suspect's age may indeed "be relevant to the 'custody' inquiry"; the Court did not find it relevant in the specific case of Alvarado. The Court affirmed that age could be a relevant and objective factor in J.D.B. v. North Carolina where they ruled that "so long as the child's age was known to the officer at the time of police questioning, or would have been objectively apparent to a reasonable officer, its inclusion in the custody analysis is consistent with the objective nature of that test". A confession not preceded by a Miranda warning where one was necessary cannot be admitted as evidence against the confessing party in a judicial proceeding. The Supreme Court, however, has held that if a defendant voluntarily testifies at the trial that he did not commit the crime, his confession may be introduced to challenge his credibility, to "impeach" the witness, even if it had been obtained without the warning. In Hiibel v. Sixth Judicial District Court of Nevada (2004), the Supreme Court ruled 5–4 that being required to identify oneself to police under states' stop and identify statutes is not an unreasonable search or seizure, and is not necessarily self-incrimination. In June 2010, the Supreme Court ruled in Berghuis v. Thompkins that a criminal suspect must now invoke the right to remain silent unambiguously. Unless and until the suspect actually states that he is relying on that right, police may continue to interact with (or question) him, and any voluntary statement he makes can be used in court. The mere act of remaining silent is, on its own, insufficient to imply the suspect has invoked those rights. Furthermore, a voluntary reply, even after lengthy silence, can be construed as implying a waiver. The new rule will defer to police in cases where the suspect fails to assert the right to remain silent. This standard was extended in Salinas v. Texas in 2013 to cases where individuals not in custody who volunteer to answer officers' questions and who are not told their Miranda rights. The Court stated that there was no "ritualistic formula" necessary to assert this right, but that a person could not do so "by simply standing mute." Under the Act of Production Doctrine, the act of an individual in producing documents or materials (e.g., in response to a subpoena) may have a "testimonial aspect" for purposes of the individual's right to assert the Fifth Amendment right against self-incrimination to the extent that the individual's act of production provides information not already in the hands of law enforcement personnel about the (1) existence; (2) custody; or (3) authenticity, of the documents or materials produced. See United States v. Hubbell. In Boyd v. United States, the U.S. Supreme Court stated that "It is equivalent to a compulsory production of papers to make the nonproduction of them a confession of the allegations which it is pretended they will prove". Corporations may also be compelled to maintain and turn over records; the Supreme Court has held that the Fifth Amendment protections against self-incrimination extend only to "natural persons." The Court has also held that a corporation's custodian of records can be forced to produce corporate documents even if the act of production would incriminate him personally. The only limitation on this rule is that the jury cannot be told that the custodian personally produced those documents in any subsequent prosecution of him, but the jury is still allowed to draw adverse inferences from the content of the documents combined with the position of the custodian in the corporation. In Griffin v. California (1965), the Supreme Court ruled that a prosecutor may not ask the jury to draw an inference of guilt from a defendant's refusal to testify in his own defense. The Court overturned as unconstitutional under the federal constitution a provision of the California state constitution that explicitly granted such power to prosecutors. The Supreme Court has held that "the Fifth Amendment does not forbid adverse inferences against parties to civil actions when they refuse to testify in response to probative evidence offered against them." Baxter v. Palmigiano, "[A]s Mr. Justice Brandeis declared, speaking for a unanimous court in the Tod case, 'Silence is often evidence of the most persuasive character.'" "'Failure to contest an assertion ... is considered evidence of acquiescence ... if it would have been natural under the circumstances to object to the assertion in question.'" In some cases, individuals may be legally required to file reports that call for information that may be used against them in criminal cases. In United States v. Sullivan, the United States Supreme Court ruled that a taxpayer could not invoke the Fifth Amendment's protections as the basis for refusing to file a required federal income tax return. The Court stated: "If the form of return provided called for answers that the defendant was protected from making[,] he could have raised the objection in the return, but could not on that account refuse to make any return at all. We are not called on to decide what, if anything, he might have withheld." In Garner v. United States, the defendant was convicted of crimes involving a conspiracy to "fix" sporting contests and to transmit illegal bets. During the trial the prosecutor introduced, as evidence, the taxpayer's federal income tax returns for various years. In one return the taxpayer had showed his occupation to be "professional gambler." In various returns the taxpayer had reported income from "gambling" or "wagering." The prosecution used this to help contradict the taxpayer's argument that his involvement was innocent. The taxpayer tried unsuccessfully to keep the prosecutor from introducing the tax returns as evidence, arguing that since the taxpayer was legally required to report the illegal income on the returns, he was being compelled to be a witness against himself. The Supreme Court agreed that he was legally required to report the illegal income on the returns, but ruled that the right against self-incrimination still did not apply. The Court stated that "if a witness under compulsion to testify makes disclosures instead of claiming the right, the Government has not 'compelled' him to incriminate himself." Sullivan and Garner are viewed as standing, in tandem, for the proposition that on a required federal income tax return a taxpayer would probably have to report the amount of the illegal income, but might validly claim the right by labeling the item "Fifth Amendment" (instead of "illegal gambling income," "illegal drug sales," etc.) The United States Court of Appeals for the Eleventh Circuit has stated: "Although the source of income might be privileged, the amount must be reported." The U.S. Court of Appeals for the Fifth Circuit has stated: ". ... the amount of a taxpayer's income is not privileged even though the source of income may be, and Fifth Amendment rights can be exercised in compliance with the tax laws "by simply listing his alleged ill-gotten gains in the space provided for 'miscellaneous' income on his tax form." In another case, the Court of Appeals for the Fifth Circuit stated: "While the source of some of [the defendant] Johnson's income may have been privileged, assuming that the jury believed his uncorroborated testimony that he had illegal dealings in gold in 1970 and 1971, the amount of his income was not privileged and he was required to pay taxes on it." In 1979, the U.S. Court of Appeals for the Tenth Circuit stated: "A careful reading of Sullivan and Garner, therefore, is that the self-incrimination privilege can be employed to protect the taxpayer from revealing the information as to an illegal source of income, but does not protect him from disclosing the amount of his income." If the government gives an individual immunity, then that individual may be compelled to testify. Immunity may be "transactional immunity" or "use immunity"; in the former, the witness is immune from prosecution for offenses related to the testimony; in the latter, the witness may be prosecuted, but his testimony may not be used against him. In Kastigar v. United States, the Supreme Court held that the government need only grant use immunity to compel testimony. The use immunity, however, must extend not only to the testimony made by the witness, but also to all evidence derived therefrom. This scenario most commonly arises in cases related to organized crime. A statutorily required record-keeping system may go too far such that it implicates a record-keeper's right against self-incrimination. A three part test laid out by Albertson v. Subversive Activities Control Board, is used to determine this: 1. the law targets a highly selective group inherently suspect of criminal activities; 2. the activities sought to be regulated are already permeated with criminal statutes as opposed to essentially being non-criminal and largely regulatory; and 3. the disclosure compelled creates a likelihood of prosecution and is used against the record-keeper. In this case, the Supreme Court struck down an order by the Subversive Activities Control Board requiring members of the Communist Party to register with the government and upheld an assertion of the privilege against self-incrimination, on the grounds that statute under which the order had been issued was "directed at a highly selective group inherently suspect of criminal activities." While no such case has yet arisen, the Supreme Court has indicated that a respondent cannot be compelled to turn over "the contents of his own mind", e.g. he cannot be compelled to reveal the password to a bank account if doing so would prove the existence of the bank account under his control. In In re Boucher (2009), the US District Court of Vermont ruled that the Fifth Amendment might protect a defendant from having to reveal an encryption password, or even the existence of one, if the production of that password could be deemed a self-incriminating "act" under the Fifth Amendment. In Boucher, production of the unencrypted drive was deemed not to be a self-incriminating act, as the government already had sufficient evidence to tie the encrypted data to the defendant. In January 2012 a federal judge in Denver ruled that a bank-fraud suspect was required to give an unencrypted copy of a laptop hard drive to prosecutors. However, in February 2012 the Eleventh Circuit ruled otherwise - finding that requiring a defendant to produce an encrypted drive's password would violate the Constitution, becoming the first federal circuit court to rule on the issue. In April 2013, a District Court magistrate judge in Wisconsin refused to compel a suspect to provide the encryption password to his hard drive after FBI agents had unsuccessfully spent months trying to decrypt the data. As a condition of employment, workers may be required to answer their employer's narrowly defined questions regarding conduct on the job. If an employee invokes the Garrity rule (sometimes called the Garrity Warning or Garrity Rights) before answering the questions, then the answers cannot be used in criminal prosecution of the employee. This principle was developed in Garrity v. New Jersey, 385 U.S. 493 (1967). The rule is most commonly applied to public employees such as police officers. The Supreme Court has held that the federal government and each state has the power of eminent domain—the power to take private property for "public use." The Takings Clause, the last clause of the Fifth Amendment, limits the power of eminent domain by requiring that "just compensation" be paid if private property is taken for public use. The just compensation provision of the Fifth Amendment did not originally apply directly to the states, but since Chicago, B. & Q. Railroad Co. v. Chicago (1897), federal courts have held that the Fourteenth Amendment extended the effects of that provision to the states. The federal courts, however, have shown much deference to the determinations of Congress, and even more so to the determinations of the state legislatures, of what constitutes "public use". The property need not actually be used by the public; rather, it must be used or disposed of in such a manner as to benefit the public welfare or public interest. One exception that restrains the federal government is that the property must be used in exercise of a government's enumerated powers. The owner of the property that is taken by the government must be justly compensated. When determining the amount that must be paid, the government does not need to take into account any speculative schemes in which the owner claims the property was intended to be used. Normally, the fair market value of the property determines "just compensation". If the property is taken before the payment is made, interest accrues (though the courts have refrained from using the term "interest"). The federal courts have not restrained state and local governments from seizing privately owned land for private commercial development on behalf of private developers. This was upheld on June 23, 2005, when the Supreme Court issued its opinion in Kelo v. City of New London. This 5–4 decision remains controversial. The majority opinion, by Justice Stevens, found that it was appropriate to defer to the city's decision that the development plan had a public purpose, saying that "the city has carefully formulated a development plan that it believes will provide appreciable benefits to the community, including, but not limited to, new jobs and increased tax revenue." Justice Kennedy's concurring opinion observed that in this particular case the development plan was not "of primary benefit to ... the developer" and that if that was the case the plan might have been impermissible. In the dissent, Justice Sandra Day O'Connor argued that this decision would allow the rich to benefit at the expense of the poor, asserting that "Any property may now be taken for the benefit of another private party, but the fallout from this decision will not be random. The beneficiaries are likely to be those citizens with disproportionate influence and power in the political process, including large corporations and development firms." She argued that the decision eliminates "any distinction between private and public use of property—and thereby effectively delete[s] the words 'for public use' from the Takings Clause of the Fifth Amendment". A number of states, in response to Kelo, have passed laws and/or state constitutional amendments which make it more difficult for state governments to seize private land. Takings that are not "for public use" are not directly covered by the doctrine, however such a taking might violate due process rights under the Fourteenth amendment, or other applicable law. The exercise of the police power of the state resulting in a taking of private property was long held to be an exception to the requirement of government paying just compensation. However the growing trend under the various state constitution's taking clauses is to compensate innocent third parties whose property was destroyed or "taken" as a result of police action. The last two words of the amendment promise "just compensation" for takings by the government. In United States v. 50 Acres of Land (1984), the Supreme Court wrote that "The Court has repeatedly held that just compensation normally is to be measured by "the market value of the property at the time of the taking contemporaneously paid in money." Olson v. United States, 292 U.S. 246 (1934) ... Deviation from this measure of just compensation has been required only "when market value has been too difficult to find, or when its application would result in manifest injustice to owner or public." United States v. Commodities Trading Corp., 339 U.S. 121, 123 (1950). In civil forfeiture, assets are seized by police based on a suspicion of wrongdoing, and without having to charge a person with specific wrongdoing, with the case being between police and the thing itself, sometimes referred to by the Latin term in rem, meaning "against the property"; the property itself is the defendant and no criminal charge against the owner is needed. If property is seized in a civil forfeiture, it is "up to the owner to prove that his cash is clean" and the court can weigh a defendant's use of their 5th amendment right to remain silent in their decision. In civil forfeiture, the test in most cases is whether police feel there is a preponderance of the evidence suggesting wrongdoing; in criminal forfeiture, the test is whether police feel the evidence is beyond a reasonable doubt, which is a tougher test to meet. In contrast, criminal forfeiture is a legal action brought as "part of the criminal prosecution of a defendant", described by the Latin term in personam, meaning "against the person", and happens when government indicts or charges the property which is either used in connection with a crime, or derived from a crime, that is suspected of being committed by the defendant; the seized assets are temporarily held and become government property officially after an accused person has been convicted by a court of law; if the person is found to be not guilty, the seized property must be returned. ^ a b "James Madison's Proposed Amendments to the Constitution", Annals of Congress (June 8, 1789). ^ Obrien, David. "Fifth Amendment: Fox Hunters, Old Women, Hermits, and the Burger Court", Notre Dame Law Review, Vol. 54, p. 30 (1978). ^ Brown, Susan. "Federal Grand Jury - "Infamous crimes"--part 1". Retrieved 14 June 2012. ^ Black's Law Dictionary, p. 690 (5th ed. 1979). ^ From "Self-Incrimination, Privilege Against," Barrons Law Dictionary, p. 434 (2d ed. 1984). ^ Amar, Akhil Reed (2005). America's Constitution. New York: Random House. p. 329. ISBN 1-4000-6262-4. ^ a b Greaves, Richard L. (1981). "Legal Problems". Society and religion in Elizabethan England. Minneapolis, Minnesota: University of Minnesota Press. pp. 649, 681. ISBN 0-8166-1030-4. OCLC 7278140. Retrieved 19 July 2009. This situation worsened in the 1580s and 1590s when the machinery of ... the High Commission, was turned against Puritans ... in which a key weapon was the oath ex officio mero, with its capacity for self incrimination ... Refusal to take this oath usually was regarded as proof of guilt. ^ "A Law Professor Explains Why You Should Never Talk to Police". Vice.com. 2016. ^ "A 5-4 Ruling, One of Three, Limits Silence's Protection". New York Times. 2013. ^ Michael J. Z. Mannheimer, "Ripeness of Self-Incrimination Clause Disputes," Journal of Criminal Law and Criminology, Vol. 95, No. 4, p. 1261, footnote 1 (Northwestern Univ. School of Law 2005), citing Malloy v. Hogan, 378 U.S. 1 (1964)). ^ 132 F. Supp. 2d 248, 251-53 (S.D.N.Y. 2001), aff'd, 279 F.3d 155, 162 (2d Cir. 2002), cert. denied, 537 U.S. 1028 (2002). ^ a b J.D.B. v. North Carolina, "United States Supreme Court", June 16, 2011, accessed June 20th, 2011. ^ Yarborough v. Alvarado, "United States Supreme Court", June 1, 2004, accessed June 20th, 2011. ^ Justice Kennedy (2010-06-01). "Berghuis v. Thompkins". Law.cornell.edu. Retrieved 2013-07-14. ^ Mukasey, Marc L.; Jonathan N. Halpern; Floren J. Taylor; Katherine M. Sullivan; Bracewell & Giuliani LLP (June 21, 2013). "Salinas v. Texas: Your Silence May Be Used Against You Re: U.S. Supreme Court Litigation". The National Law Review. Retrieved 7 July 2013. ^ "Boyd v. United States :: 116 U.S. 616 (1886) :: Justia U.S. Supreme Court Center". Justia Law. ^ Miniter, Frank (2011). Saving the Bill of Rights: Exposing the Left's Campaign to Destroy American Exceptionalism. Regnery Publishing. p. 204. ISBN 978-1-59698-150-8. ^ Justice Blackmun (1988-06-22). "John Doe v. United States". Law.cornell.edu. Retrieved 2016-01-31. ^ Justice Stevens (1988-06-22). "John Doe v. United States". Law.cornell.edu. Retrieved 2016-01-31. ^ Justice Stevens (2000-06-05). "United States v. Hubbell". Law.cornell.edu. Retrieved 2016-01-31. ^ See docket entry 247, "ORDER GRANTING APPLICATION UNDER THE ALL WRITS ACT REQUIRING DEFENDANT FRICOSU TO ASSIST IN THE EXECUTION OF PREVIOUSLY ISSUED SEARCH WARRANTS", United States v. Fricosu, case no. 10-cr-00509-REB-02, Jan. 23, 2012, U.S. District Court for the District of Colorado, at . ^ Jeffrey Brown, Cybercrime Review (January 27, 2012). "Fifth Amendment held not violated by forced disclosure of unencrypted drive". ^ Jeffrey Brown, Cybercrime Review (February 25, 2012). "11th Cir. finds Fifth Amendment violation with compelled production of unencrypted files". ^ Kravets, David (23 April 2013). "Here's a Good Reason to Encrypt Your Data". Wired. Condé Nast. Retrieved 24 April 2013. ^ Madison, P.A. (2 August 2010). "Historical Analysis of the first of the 14th Amendment's First Section". The Federalist Blog. Retrieved 19 January 2013. Amar, Akhil Reed; Lettow, Renée B. (1995). "Fifth Amendment First Principles: The Self-Incrimination Clause". Michigan Law Review. The Michigan Law Review Association. 93 (5): 857–928. doi:10.2307/1289986. JSTOR 1289986. Davies, Thomas Y. (2003). "Farther and Farther From the Original Fifth Amendment" (PDF). Tennessee Law Review (70): 987–1045. Retrieved 2010-04-06. Don't Talk to the Police — Lecture by Law Professor James Duane of the Regent University School of Law and Officer George Bruch from the Virginia Beach police department.